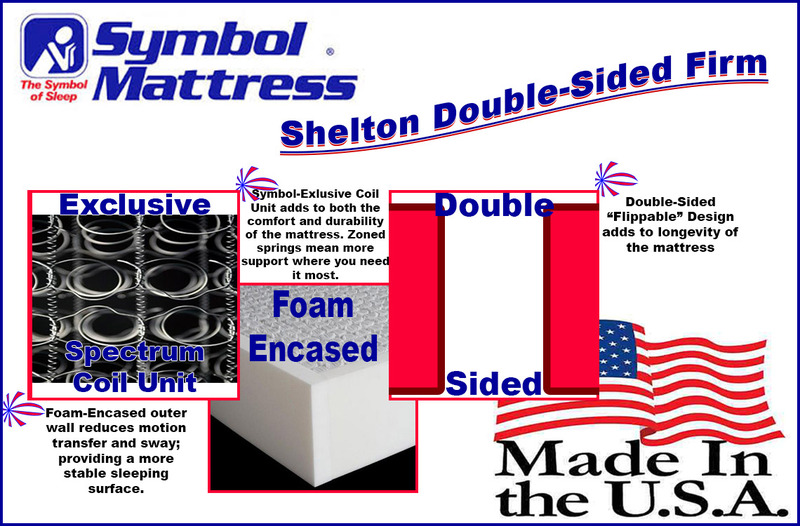 A great addition to the "Comfortec" line, the Double-Sided "Shelton Firm" boasts a coil unit that's exclusive to Symbol Mattress. 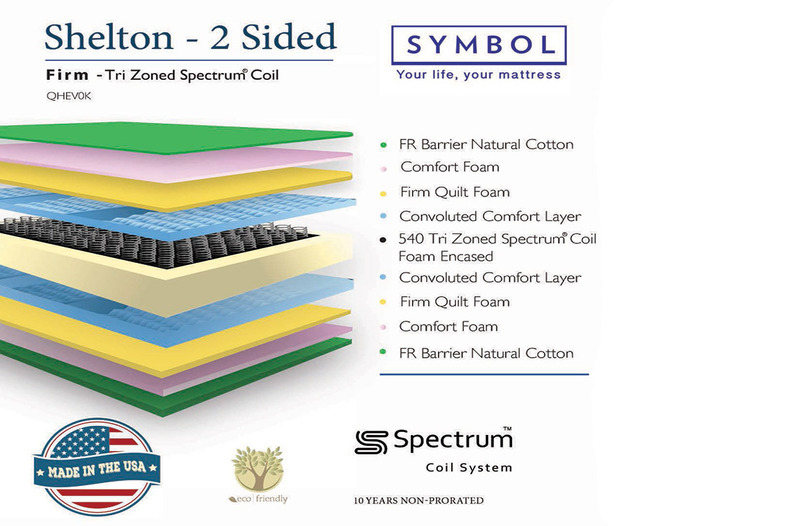 The "Spectrum 540 3-Zone" is somewhat of a breakthrough in the sleep products industry! The open coil design is made to be soft on the surface but it progressively firms up as weight is applied to it. 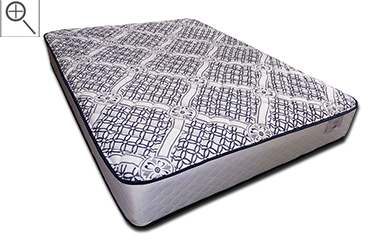 This offset spring design contours very well to your body and adds some durability to the mattress. Symbol has also put 30% more coils into the lumbar region for added support - where you need it the most. Additionally, the longitudinal helical lacing helps to cut down on motion transfer - so if your partner gets up or moves around a lot, you likely won't feel it. With all of the great technology inside of the Shelton, it isn't overdone with fancy-named features or useless (extra) layers of foam. This mattress is more the "old school" type of product and feel. It's reasonably simple in design, with emphasis on quality craftsmanship and it harkens back to when mattresses lasted much longer and cost less. Firm in feel but with enough body contouring coming from the spring unit - and just enough high-quality comfort foam layers - this model is sure to become one of the most popular mattresses at Michigan Discount Mattress. Call to see if we've got it in stock today! The 540 "Spectrum" VertiCoil design is a Symbol-only exclusive that offers more comfort than the Bonnell Unit that was in the Franklin and, it's quite durable as well. There is even a greater coil density in the middle-third of the mattress - the lumbar region - than in the rest of the bed. 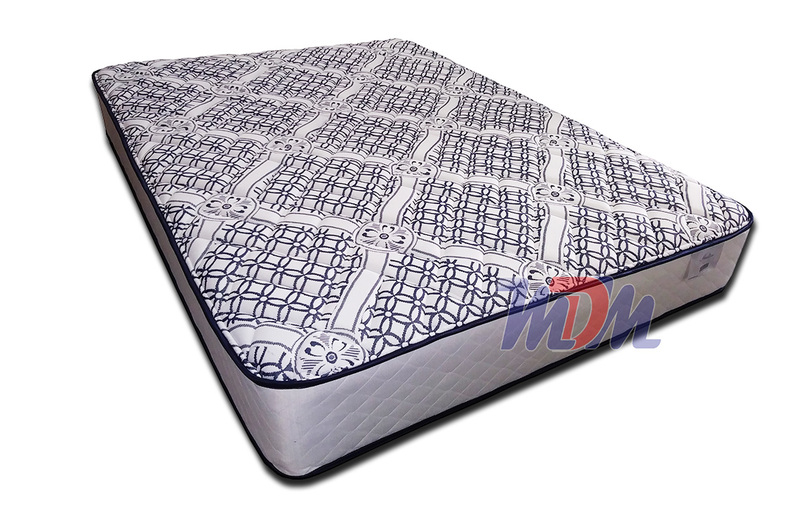 The style of spring attachment uses "Helical Lacing Wire" which helps to cut down on partner disturbance so, this mattress is great for couples. The foam encasement also helps to eliminate motion transfer, as well. This mattress has a nice firm feel. It isn't exactly a 'box of rocks' but it does the trick if you're seeking a firm. It has just enough body contouring that you actually feel a bit of the spring unit conforming to your body and, the layers of foam are quite dense and firm. Having a double-sided mattress adds to durability and a longer period of your bed feeling "brand new". I'd highly recommend this mattress model to anyone seeking a conventional (almost 'old school') firm mattress feel - who likes to get a lot of bang for their buck. No crazy bells and whistles but a lot of support, lots of comfort and a high level of durability. The Symbol "Comfortec" line has cranked out yet another great mattress.